Aim: To determine the effect of surface treatment on micro shear bond strength of two indirect composites. Materials and Methods: Blocks of 2 Χ 7 Χ 20 mm dimensions were made from two kinds of resin composites, Gradia and Signum plus. Samples were subjected to secondary curing to complete polymerization. They were divided into five groups: control without any preparation, second group sandblasted with aluminum oxide, third, fourth and fifth groups were lased under a beam of 0.5, 1 and 2 W respectively. Panavia resin cement was placed on the composite blocks using tygon tubes and cured and micro shear bond strength was measured. One sample of each group was observed under electronic microscope. Data was analyzed by two-way ANOVA and Tukey's multiple comparison tests. Results: For Gradia composite, the sandblasted group showed highest strength (25.7±2.9 MPa) followed by the laser beam of 1 W group (with 23.6± 2.8 MPa). In Signum composite, the laser beam of 1 W (21.4±4.2 MPa) showed the highest strength followed by the sandblasted group (with 19.4±3.2 MPa). Conclusion: Surface treatments using sandblast and laser beam of 1W power along with silane are two effective methods to increase the bond strength of composites. There are different methods of creating mechanical and chemical surface treatment of composite and ceramic crowns which include sandblasting, use of silane, etching and laser. The aim of the present study is to evaluate the bond strength of two indirect composites using different surface treatment methods (sandblast, silane, laser beam with three different power energies). In this experimental study, two different types of indirect resin composites (Gradia and Signum plus) and one type of resin cement (Panavia) were used. 150 composite blocks with 2 × 7 × 20 mm dimensions were made. Half of composite blocks were made from Gradia and another half were made from Signum plus indirect composites. Split metal mold was used for making these blocks. After primary curing using halogen light curing unit, all samples were post cured again inside laboratory light (Hager werber) for another 10 min. All samples were polished using 220 - 1200 grit sandpaper under running water to make an even surface. Blocks prepared from each composite were randomly divided into 5 groups. Group 1: For this group no surface treatment was done. Samples were rinsed with water for 20 s, air dried for 10 s, after that 37% phosphoric acid was applied, rinsed and air dried. One layer of silane (from Panavia kit) was applied on samples and thin dried after 3 minutes using air spray. Group 2: For this group samples were treated using aluminum oxide particles of 50 with 2 mm distance and 80 PSI for 10 s, samples were cleaned in an ultrasonic device for 2 min, air dried and then were treated with silane. Group 3: In this group surface treatment of composite was done using laser beam of 0/5 W and pulse energy of 25 mJ and air pressure of 11% without water. Surface treatment of this group was done with a mild speed for 3-5 s with 1-2 mm distance from surface. The laser beam used was Er,Cr: YSGG with wave length of 2780 nm (Biolase company, USA). Time for each pulse was 140 μs with 20 Hz frequency. Group 4: In this group composite surface was treated with 1 W of 50 mJ pulse energy. The rest of work was similar to previous group. Group 5: In this group laser beam of 2 W with pulse energy of 100 mJ was used. The rest of work was similar to Group 3. From each group for both composite samples (before bonding the resin cylinders), one sample was selected for SEM evaluation so that type and amount of surface changes can be evaluated. For this step we used tygon tube with internal dimension of 0/7 mm and height of 1mm. The tygon tubes were placed over treated surface of composite blocks and then resin cement (Panavia) was mixed according to manufactures' instructions and was packed inside tygon tube; each tube was light cured for 40 s, after 1 h tubes around the resin cylinders were cut off using BP blade and removed from around the resin and samples were kept at 37 o C temperature for 24 h.
For testing the bond strength, we used micro tensile bond strength tester machine and in order to evaluate micro shear bond strength of samples we converted the tester machine. Speed of 0/5 mm/min was applied till failure occurred. The results of the study were evaluated using SPSS statistical analysis software and two-way ANOVA test. For comparison between two groups, Tukey's multiple comparison test was used. P value was considered as 0.05. Results of the present study are shown in [Table 1] and [Table 2] and Graph 1. 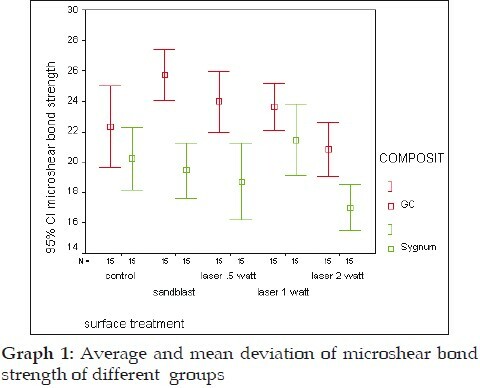 The highest amount of microshear bond strength was seen in Gradia composite with sandblasted surface treatment and in Signum Plus with laser beam of 1 W.
The least amount of strength belonged to surface treatment with 2 W laser beam for both the composites. Two-way ANOVA showed significant differences between two different types of composite in such a way that Gradia composite showed higher bond strength than Signum plus (P<0). Different types of surface treatment also showed statistically significant differences. Tukey's multiple comparison test was also used for evaluating bond strength between groups. 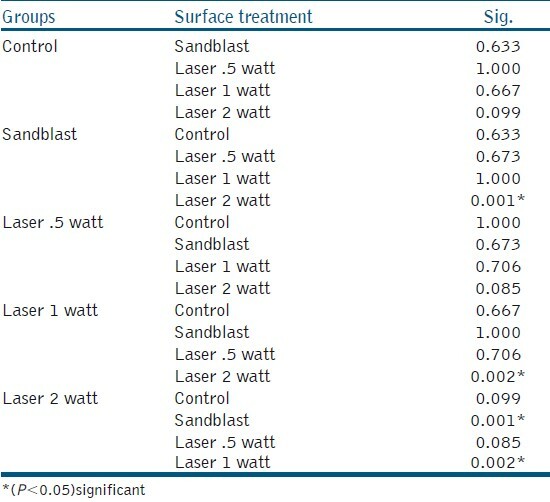 There was no statistically significant differences between sandblasted and lased (1 W) groups for both the composites, but there were statistically significant differences between these 2 groups and group lased with 2 W.
Composite surface of control group which was polished using sand paper of 220- 1200 grit was even and smooth for both types of composites; but for sandblasted surface of composite, surface roughness was obvious and even throughout of treated surface and no destruction of composite structure was seen. This even surface roughness had created an increased bond surface by increasing surface roughness, depressions also created on the surface and destruction of composite could also be seen. For lased surfaces, in addition to creating surface roughness and irregularities, deep depressions could also be seen which could be the reason for subsurface destruction and weak bond. In addition, some deep cracks and undercuts also were seen in lased surfaces. Start Many methods are advised for increasing bond strength like micro abrasion,  etching with hydrofluoric acid,  increasing surface roughness using sandblast and laser. In the present study, two different types of indirect composite (Gradia and Signum plus) were used and different surface treatment methods like sandblasting, laser and silane methods were used. Silanes are double molecules which cause chemical bonds of silicon dioxides with hydroxyl groups of ceramic surface (si-o-si) and have little ability to copolymerize with organic resin matrix. In the present study, similar to a study conducted by Burnett,  we used a micro etcher device and aluminum oxide particles of 50 dimension with a contact angle of 90° for 10 s for the whole surface and 80 psi pressure from a distance of 2 mm from the surface. Laser is one of the methods of surface treatment used for improving micromechanical retention and bond strength of resin cement to ceramic. Use of Er: YAg laser has been increasing in the field of dentistry for removing dental caries without damaging the surrounding sound tooth structure. This laser has got FDA (Food and drug administration) approval in 1997 for dental treatment. For three groups of the present study, Er: Cr:YSGG laser with three different powers was used. In the present study, results of SEM evaluation showed that exposure of composites to laser beams caused irregularities and surface roughness which do not follow particular pattern. By increasing the laser power, these changes also increase. But in Gradia composite, increasing the surface roughness and depressions did not necessarily increase bond strength. In sandblasted groups, bond strength was higher than laser group, despite creating more regular and even surface without any under cuts. It can be explained that during sandblasting, removal of resin matrix can facilitate bond between silane and SiO 2 filler particles, but laser beams along with creating micromechanical retention and deep undercuts could also cause destruction of crystalline and matrix phase and also separation of these two phases from each other. In Group 4 of Signum composite where 1 W laser beam was used, it showed higher bond strength compared to sandblasted group. It can be explained that absence of SiO 2 filler particles in this material prevented effect of sandblast technique compared to Gradia composite which has got this type of filler. As it has been mentioned before, one of the most important reasons for improving bond strength after sandblasting and using silane in porcelains containing SiO 2 filler particles is creating Si-O-Si bond between silane molecules and this filler, the same can be explained with composites with silica filler particles like Gradia. Bond strength in laser group of 2 W energy for both types of resin composite was very low. The differences between these two groups could be due to physical destruction because of increased temperature and increased destruction of chemical structure and crystals present in composite and decrease ability of molecules to bond with silane and or resin cement. Considering the above-mentioned factors affecting bond strength of indirect composites, it is difficult to draw a precise conclusion, unless more studies to be done under different conditions to see best results. Sandblasting of Gradia composite and lasing Signum Plus composite with 1 W showed highest bond strength. Use of 2 W laser power can decrease bond strength. Use of sandblast and laser along with silane for surface treatment can improve bond strength of indirect composites. This investigation was supported by Deputy of Research, Shaheed Beheshti University of Medical Sciences, Tehran, Iran. This article was based on an undergraduate thesis (thesis number 2961) by Dr. Matinfard, which was successfully completed under the supervision of Dr. Maryam Moezizadeh with the close cooperation of the Operative Department of Dental School of Shaheed Beheshti University of Medical Sciences. 1. Peutzfeldt A. Indirect resin and ceramic systems. Oper Dent 2001;Suppl6:153-76. 2. Shortall AC, Baylis RL, Wilson HJ. Composite inlay/luting resin bond strength surface treatment effects. J Dent 1996;24:129-35. 3. Reinhardt JW, Boyer DB, Stephens NH. Effects of secondary curing on indirect posterior composite resins. Oper Dent 1994;19:217-20. 4. Donly KJ, Jensen ME, Triolo P, Chan D. A clinical comparison of resin composite inlay and onlay posterior restorations and cast-gold restorations at 7years. Quintessence Int 1999; 30:163-8. 5. De Gee AJ, Feilzer AJ, Davidson CL. True linear polymerization shrinkage ofunfilled resins and composites determined with a linometer. Dent Mater1993;9:11-4. 6. Nilsson E, Alaeddin S, Karlsson S, Milleding P, Wennerbergg A. Factors affecting the shear bond strength of bonded composite inlays. Int J Prosthet 2000;13:52-8. 7. Barkmeier WW, Shaffer SE, Gwinnett AJ.Effects of 15 vs 60 second enamel acid conditioning on adhesion and morphology. Oper Dent 1986;11:111-6. 8. Browne RM, Tobias RS. Microbial microleakage and pulpal inflammation: A review. Endodon Dent Traumatology 1986;2:177-83. 9. Lin S, Caputo AA, Eversole LR, Rizoiu I. Topographical characteristics and shear bond strength of tooth surfaces cut with a laser-powered hydrokinetic system. J Prosthet Dent1999;82:451-5. 10. Gholami G, Fekrazad R, Esmaiel Nejad A, Kalhori K. An evaluation of the occluding effects of Er;Cr; YSGG, Nd: YAG, Co2 and diod lasers on dentinal tubules: A Scanning Electron Microscope, in vitro study.PhotomedLaser Surg 2011;29:115-21. 11. Nilsson E, Alaeddin S, Karlsson S, Milleding P, Wennerbergg A. Factors affecting the shear bond strength of bonded composite inlays. Int J Prosthet 2000;13:52-8. 12. DeSchepper EJ, Tate WH. Powers JM. Bond strength of resin cements to microfilled composites. Am J Dent 1993;6:235-8. 13. Azarbal P, Boyer DB, Chan KC. The effect of bonding agents on the interfacial bond strength of repaired composites. Dent Mater 1986;2:153-5. 15. Brosh T, Pilo R, Bichacho N, Blutstein R. Effect of combinations of surface treatments and bonding agents on the bond strength of repaired composites. J Prosthet Dent 1997;77:122-6. 16. Swift EJ Jr, Brodeur C, Cvitko E, Pires JA. Treatment of composite surface forindirect bonding. Dent Mater 1992;8:193-6. 17. Soderholm KJ. Flexure strength of repaired dental composites. Scan J Dent Res 1986;94:364-9. 18. Kato H, Matsumura H, Ide T, Atsuta M. Improved bonding of adhesive resin to sintered porcelain with the combination of acid etching and a two-liquid silane conditioner. J Oral Rehabil 2001;28:102-8. 19. Bailey JH. Porcelain-to-composite bond strengths using four organosilane materials. J Prosthet Dent 1989;61:174-7. 20. Swift EJ Jr, Brodeur C, Cvitko E, Pires JA. Treatment of composite surface forindirect bonding. Dent Mater 1992;8:193-6. 21. Carlos Jo Soares. Surface treatment protocols in the cementation ofceramic and laboratory-processed composite restorations. : A literature review. Esteth Restor Dent 2004;7:224-35. 22. Silveira BL, Paglia A, Burnett LH, Shinkai RS, de Paula Eduardo C, Spohr AM.Micro-tensile bond strength between a resin cement and an aluminous ceramic treated with Nd:YAG laser, Rocatec System, or aluminum oxide sandblasting. Photomed Laser Surg 2005;23:543-8. 23. Burnett LH Jr, Shinkai RS, de Paula Eduardo C. Tensile bond strength of a one-bottle adhesive system to indirect composites treated with Er:YAG laser, air abrasion, or fluoridricacid. Photomed Laser Surg2004;22:351- 6. 24. MaedaT, Eguro T, Otsuki M. Ablation of tooth restorative materials by Er:YAG laser irradiation. Presented at the International Society for Lasers in Dentistry, Bruxels.(2000). 25. Cavalcanti AN, Foxton RM, Watson TF, Oliveira MT, Giannini M, Marchi GM. Bond strength of resin cements to a zirconia ceramic with different surface treatments. Oper Dent 2009;34:280-7. Mirzaie, M. and Garshasbzadeh, N.Z. and Yassini, E. and Shahabi, S. and Chiniforush, N.